When providingHarrisburg in-home care for your senior loved one, properly preparing the house can make him or her more comfortable and safe. These 5 tips can help you get your home ready for your loved one’s arrival. Choosing the right bedroom for your loved one to rest in is essential. Make sure the room isn’t too far from the bathroom, is on the ground floor, has easy access to shared spaces, and has sufficient storage for his or her items. 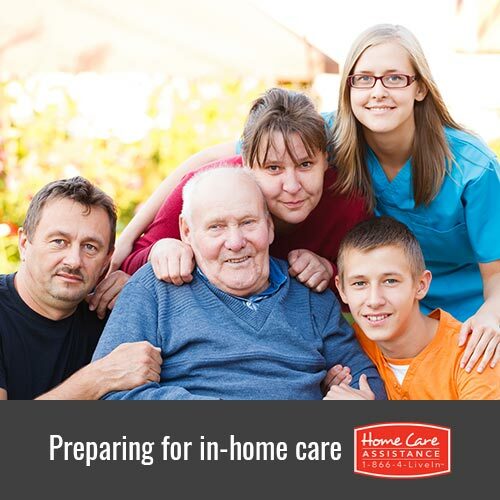 When becoming a Harrisburg caregiver, your home may need improvements to ensure your loved one can move around easily. There should be sufficient space around furniture, safety rails should be installed on the bed, and doorknobs should be switched to levers. The bathroom should also have a handrail installed near the bath and toilet to assist your loved one when using the restroom. When your loved one moves into your home, you may need to clear out unnecessary clutter to allow him or her to have more space to move freely. Make sure your loved one has allday-to-day items stored in his or her room, while antiques, photos, and heirlooms can be carefully boxed and placed in storage or shared with family and friends. The elderly are more susceptible to carbon monoxide, even if the amount leaking is low. Carbon monoxide detectors are a good idea for every home, but are essential when your loved one lives with you. Look for a model featuring strobe lighting or vibrating options if your loved one has hearing impairment. Your loved one’s skin may be delicate and can burn more easily because of hot water in the sink or shower. Lowering the water temperature of your water heater or installing an anti-scald device can help ensure he or she won’t get burned while washing.